Too Exposed to the elements. Provide more protection from the elements. Provide creature comforts like lights and ceiling fans. Feel more like an extension of the house and when screened in... they keep the bugs out. So, below are some of Clawson Architects' favorite porches. Enjoy! With a covered balcony off the Master Suite, a porch off the kitchen dining area—down to a patio, this client has outdoor living spaces that allow them to enjoy their property from many levels. And for those who can't decide, you can have it all ...this house also has a deck off the kitchen on the other side. Porches act as an additional room. From the first signs of spring until the end of fall, porches are great places to entertain day and night. Nothing is more chaming than than the Period Home with the wrap around front porch. Wimsical wind chimes and a cool drink complete the mood on a hot summer day. UPDATE: over 21 years ago, we were approached by a young couple on our block in Jersey City about renovating with their brownstone. We did. Fast forward 21 years, they move around a bit and find themselves purchasing a home in Maplewood, NJ that needed some work as well. They look up architects in the area and find us! 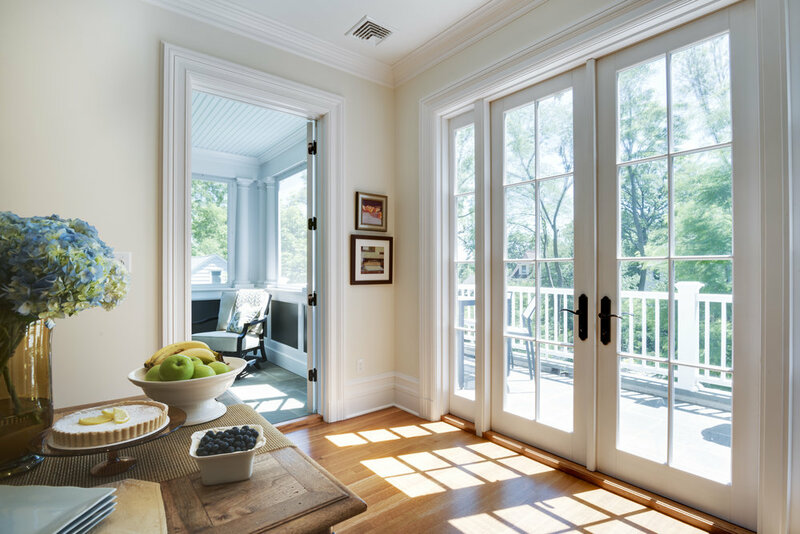 The new space included a renovated kitchen, and a master bedroom suite over an expanded informal dining area, screened porch and terrace as well as major landscaping with a variety of out door living spaces. So, they have choices....but the screened porch is a winner. Informal dining area off the kitchen with access to al fresco dining on the terrace or the screened porch. al fresco dining for those perfect outdoor conditions. And a Screened porch has views of the tree tops and the church bell tower. This home is just a block from town on a busy, sloping, corner lot. The elevated porch with low wall offers privacy from the passers by on the street level. Exposed on three sides, the rustling of the the leaves in the breeze makes you feel like you are in a tree house.